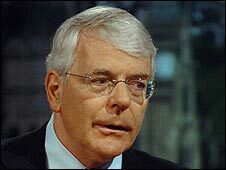 Former Prime Minister Sir John Major has criticised Tony Blair's handling of the Iraq war and his presentation of the case for invasion in March 2003. Sir John said he had reluctantly backed the war because he believed what Mr Blair had said as prime minister. But now, he said, big questions had been raised by the evidence given to the Chilcott Inquiry into the war. He told the BBC the argument that Saddam Hussein was a bad man and must be removed was an "inadequate" one. Sir John said it now seemed there were doubts before the invasion about whether there were weapons of mass destruction in Iraq. In an interview with BBC Radio 4's Today programme, he said he wanted to know whether the Cabinet had known about those doubts. He said: "I had myself been prime minister in the first Gulf War, and I knew when I said something I was utterly certain that it was correct, and I said less than I knew. "I assumed the same thing had happened and on that basis I supported reluctantly the second Iraq war." Sir John said he did not know whether the invasion was potentially illegal, but he added that in the mid-1990s President Clinton's administration had raised the question of regime change with his officials. They replied that any attempt to remove Saddam Hussein as a bad man had to be legal and viable. Sir John said the argument that someone was bad was an inadequate argument for war. "There are many bad men around the world who run countries and we don't topple them, and indeed in earlier years we had actually supported Saddam Hussein when he was fighting against Iran. "The argument that someone is a bad man is an inadequate argument for war and certainly an inadequate and unacceptable argument for regime change." Sir John said concerns about the Iraq war needed to be addressed if the public's trust in politics was going to be restored. But he said spin was also "a real problem" and the government needed to get rid of advisers who "exercise the black arts" who say things which are "often questionable, if not downright dishonest". "I think we can get respect for Parliament back providing governments and oppositions are frank... providing they don't let spin doctors perpetrate half truths and don't produce absurd slogans like boom or bust and whiter than white," said Sir John. "It won't be easy and it won't be quick, but it is absolutely essential, in my view," he added. Politics also needed to reassert the "independence of mind of the backbencher" - so the whole House of Commons was not governed by the executive and whipping system, he said. It was "degrading" for members of parliament to have to respond to the party line with the "parrot slogan of the day", he added. He also said it was "essential" that there should be a career structure within parliament for MPs who do not become government ministers - and the only way that could be done was through select committees. "I think electing the select committee chairman is right, I think paying the select committee chairman to at least a level of minister of state - and perhaps of most senior committees, cabinet ministers' level - is entirely right," he said. This would encourage parliament to bring people in who are a little older than sometimes they have been in recent years, Sir John said. Select committees should also be given more powers and more things to do, he added. Referring to politicians' pay packets, Sir John said the "absolute fundamental point" was a pay structure should not "disqualify anyone, whatever their personal circumstances of income, from standing as a member of parliament". "When you judge it from that basis, against comparative professions, members of parliament are underpaid. "I think it would be more attractive to have a larger pay structure and minimalise and control any allowances that are available much more strictly than in the past," he added. Tony Blair is due to answer questions at the Chilcott Inquiry in the next few weeks. What do you expect from the Iraq inquiry?